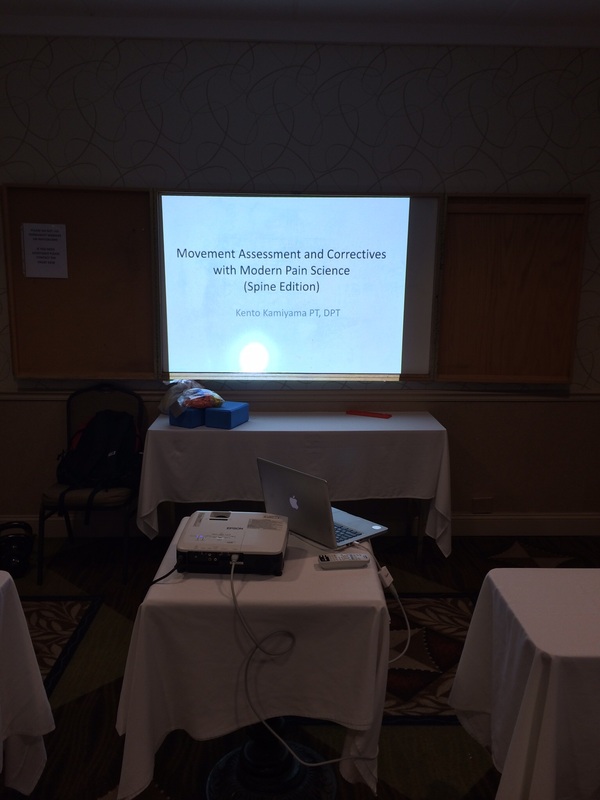 This past weekend, I had the honor of teaching a group of physical therapists and physical therapy assistants my course “Movement Assessment and Corrective of the Spine” through Medical Minds in Motion, LLC. I’ve always dreamed of teaching a professioanl course since I was in PT school and the fact that it became a reality was a feeling I couldn’t explain. As surreal the experience was, there were some challenges and struggles . Hence I thought it was appropriate to write a blog post on what I’ve learned. Without further ado, here are the top 5 things I learned. 1. When you are able to teach, the material becomes more solidified and have deeper meaning. Benjamin Franklin once said “Tell me and I forget, teach me and I remember, involve me and I learn”. Although this quote seems more appropriate to the students, it also applies to me as an instructor. As I taught about pain science, movement assessment/corrective and breathing, the information became even more enlightening and deep . Either it was re-inforcing what I already knew or I found a different way to explain concepts, it really help me solidify the information. All the information that seems irrelevant was forming into ‘one’ big story. Things started to connect more and I believe my attendees felt the same. 2. We learn better by doing. When I was a child, I remember going to a summer camp counselor training and hearing the phrase “learning by doing” is the best way to learn. Repeating again Benjamin Franklin’s quotes “Tell me and I forget, teach me and I remember, involve me and I learn”, I strongly believe this to be true. My course is a one day 8 hour course that includes lecture and a large lab component since I believe ‘feeling’ and ‘doing’ the assessment and correctives is a large componenet to learning. To be honest, since my lecture material wasn’t that long, I was worried I would breeze through the course. However, with a strong lab component, it turned out to be perfect timing AND many students were interacting and asked thought provoking questions. Teaching is interesting. No matter how many times I practiced the lecture, when you see and feel the reactions from the audience you receive different signals. Some information you can tell they were interested and understood. Some information, they would tilt their heads and question. At those moments, I realized that my information can be organized with a better flow and there are many other ways that I could make an information come to life. I have plenty of learning to do myself. I know for a fact that I will not be where I am today without the inspiration, education and courage from my family, friends and colleague. I gave a lot of acknowledgement in the lecture but I do want to give special acknowledgement to Dr. Kathy Dooley for giving me the inspiration to take the leap towards my goal. She has been a huge mentor and inspiration to further my studies but to improve as a overall practitioner and person. Thanks Kathy :). If you haven’t checked her out, check her blog at www.drdooleynoted.com. Also if you want anatomy come to life through movement, check out her anatomy and movement course called Immaculate Dissection. I’ve heard from instructors that the teaching aspect is great but the traveling aspect can be draining. Even though my seminars were super close, it still drained me! I have some preparation and learning to do for my next teaching in August in Florida. Awesome! That MMIM schedule can make you feel like the away team! Always great to reflect and learn! Especially with pain science, definitely can’t win them all but even reaching some and making them seek out more is key! Hi Dr E! Thank you for the comment. Pain science was definitely the hardest one for sure. However, the more I practice, the better I get with pain science. I just have to keep improving. You’ve been a huge part of my growth thanks to your blog and teaching. Thank you! !